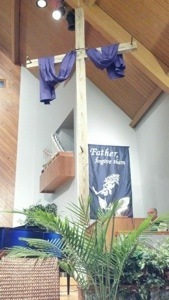 Remembering the sacrifice of Christ on Good Friday makes the reality of his resurrection even sweeter on Easter Sunday. As Pastor Chris Icenogle of Brookdale Covenant Church reminded us tonight: If it is true that “truth sits on the lips of dying men” (Matthew Arnold), then how much more significant are the last words of Jesus. “Father, forgive them, for they do not know what they are doing.” Jesus leaves us with words of mercy and compassion. “Woman, here is your son. Son, here is your mother.” Even up until the end, Jesus could be trusted to take care of his mother, which means He can be trusted to take care of us. “Truly, I tell you, today you will be with me in paradise.” Jesus again gives the promise of eternal life. “My God, My God. Why have you forsaken me?” This is the moment when Jesus, who was sinless, expresses his agony in that he became sin for us. “I am thirsty.” God, in Jesus Christ, was fully human. This reminds us that he knows what it means to be thirsty and to feel pain. Therefore, he can have compassion towards us. “Father, into your hands I commit my spirit.” Even Jesus, being God in flesh, prays during his final hours. What a great reminder for us to remember the significance of prayer. “It is finished.” Jesus wasn’t proclaiming defeat but triumph! Sin and death did not win. The resurrection of Christ overcame the power of sin and death! Previous Encouragement Changes Lives Next Who Gains the Most from a Mission Trip?